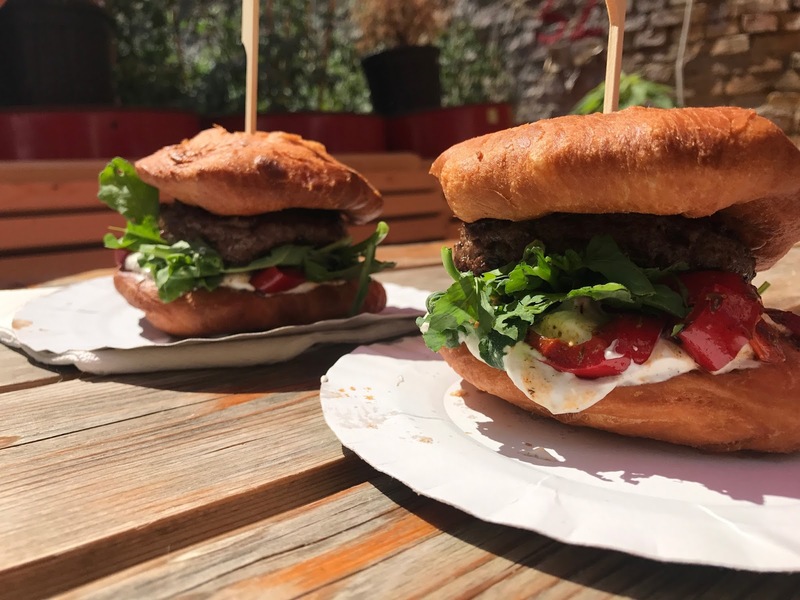 We are so lucky to be staying just a short walk away from Karavan, a street food market offering a variety of great food and drink. We’re loving it so much that we in fact had both our lunch and dinner here today! Whilst watching others’ Budapest vlogs leading up to our visit, we knew that Langos was a must try for us whilst here. It’s a deep fried flatbread, traditionally served with sour cream, yoghurt or mashed potatoes and other toppings. It does turn out that we’d be trying it out in a non traditional way however, as one of the street food stalls offered it as a replacement for a burger bun! We both chose the same beef burger with sheep’s cheese and tomatoes, and ignoring the fact of how unhealthy it is, it was absolutely delicious! With the sun shining through, it was the perfect opportunity to also try out the nitrogen ice cream on offer from a different stall. 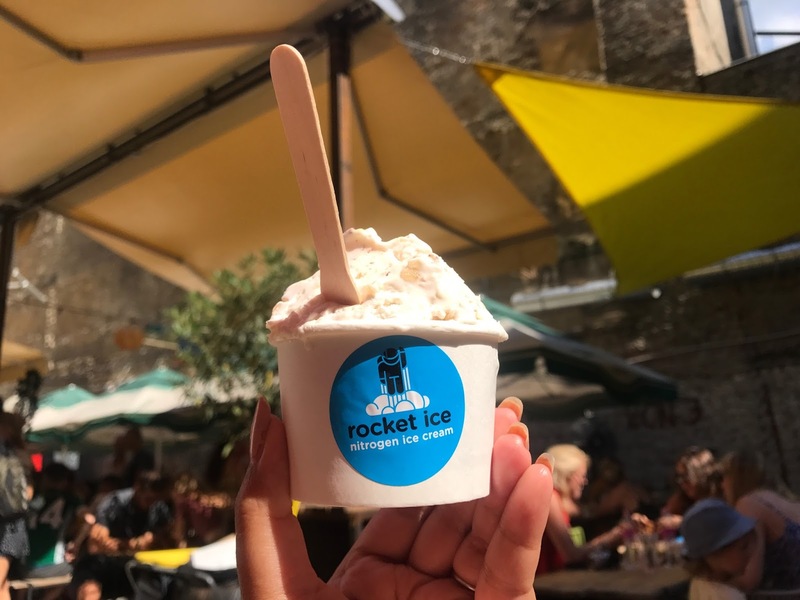 It is made differently to your conventional ice cream, as nitrogen freezes the ice cream much more quickly, creating smaller crystals and denser, creamier ice cream. You might ask if it’s dangerous, but of course it is not. The nitrogen is fully evaporated by the time the ice cream has been made, and nitrogen is tasteless, odourless – after all, 78% of the air we breathe is nitrogen. Jessica opted for Berry Zola, and I got Brownie Bliss – and bliss is exactly what it was! 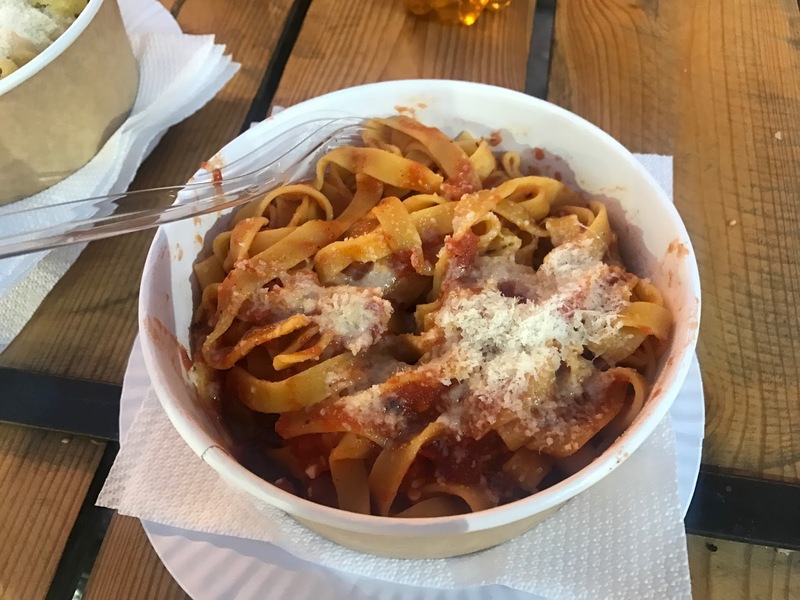 Following an afternoon touring Heroes Square and City Park, which you can read about in our travel post, we made a return to Karavan! This time we both chose the classic pasta option of carbonara and arrabbiata. All speaks for itself really, and with a portion of chips and some ice teas, it was another good meal in this great part of Budapest. With so much more to try out here and in the surrounding streets, you can expect more from here in the coming days. Budepest sounds really cool! They sell Langos here in Germany too but I wonder if it tastes better in Hungary! Burgers looks delicious, and how cool is Nitrogen ice cream?!? Definitely gotta check out your travel post.